"Gore always used to say 'Whatever you do, don't worry about it. be informed only by that which you perform in the first place'. was going to work out' and he said 'Yeah but I was lying'. He said 'I had to tell you something'." Why would you go to see the latest summer would-be billion dollar-making blockbuster? To have fun? To be awed? To prove your bladder can handle the almost three hour running time? Or to care (I know that's out on a limb but someone has to say it)? For me, it was the trailer. The trailer did exactly what it was meant to do; present a mouth-watering glimpse at the whole shebang and re-introduce some well loved characters (well, just the one actually) and some jaw dropping visuals. I was sold (as opposed to sold out). No, this isn't me leading you down the rosy garden path to find your neighbour's dog has made a swirly brown deposit at the gate. It's hard to dislike such a romp executed with such panache. But there is a feeling of (here comes the poop) a cinematic curry night out. I now feel bloated beyond comfort, full of sub-sub-plots, sub-plots, agendas, in-fighting, revenge, betrayal, villains with the unlikely motivation of securing a way to get tea - of all things - from one continent to the next and so much swashbuckling that in the end, awash with swash, I buckled. From one fifteen minute stretch to the next (and there are almost twelve such segments) I did not know what one character wanted clearly enough except that Jack wanted what was best for him. Fair enough. I just held on to Jack's dreads for the ride. 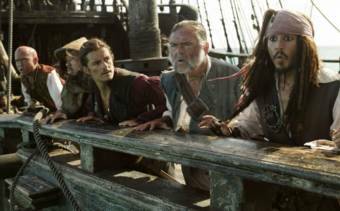 If Pirates 3 has a revelatory plus point, it's giving surrealism a free reign and a mammoth budget. Glimpses in the trailer showed us that Jack Sparrow's hell dimension was an odd one, (you did know he was 'dead', didn't you, not that this means much in these sorts of movies) perhaps odder than Jennifer Lopez's dream journeys in the splendidly gruesome The Cell. But I wasn't prepared for the perfection of the imagery and the downright Dali slant to the whole experience. Yes, there are multiple Jacks (I suppose any vane, selfish egoist would be surrounded by doppelgangers in any kind of punishing afterlife) and it's amusing but what's really impressive is the internal logic of this hell dimension. The imagery works and never jars. You never say "why are those stones actually crabs?" You just go with the whole sandy flow of it. Maybe Depp's central Sparrow grounds us in humour so we don't notice that Salvador himself has just half-inched a quarter of a Jerry Bruckheimer picture. That's quite a coup and all power to Verbinski for pulling it off. You can forgive a lot of internal logic self-combusting in a hell dimension but once he and his gallant saviours are out, (in the real world, ha!) the fantasy reigns take hold of the beast and Dali leaves the building and random surreality clocks in as if it had been at a night job and reported to work the next morning too tired to actually make any even surreal sense. A shame. After that weirdly engrossing hour, Pirates 3 descends into a 'who wants what and what are they prepared to do to get it' movie. That's usually not a problem but there are at least five main characters who are all seeking what's best for them and what's best for them is confusing to folk like me. But hell, hurrah for Hollywood! Even stymied by logic and motivation, there's still enough on show to go 'Wow!' at. There is no question in my mind that the craftsmanship, talent and back breaking composite work on Pirates of the Caribbean: At World's End is not only world class, it's probably the best I have seen. The character performances under layers of latex, motion capture blobs and prosthetics are first rate (if they have been rendered faithfully by their digital enhancement – see the quote above). With only a massive whirlpool and waterfall as stand out digital creations (for none exists in the real world), the reality summoned up by the effects department is breathtaking. If Pirates 1 had hit our screens thirty years ago, it would have been hailed as greater than 2001 in terms of its faked reality. That's progress for you, those dinky little motherboards and baby silicon chips. Look how they've grown. So that's a big box ticked as we all knew it would be if we'd seen the first two piratical outings. Depp (rendered in multiple versions in his afterlife) is still the maypole around which plot and peripheral characters dance. His Captain Jack Sparrow maintains his fascination (I was secretly afraid I'd be bored with him by number three) and the character gets a meaty payoff with his oft courted inspiration Keith Richards finally agreeing to turn up in a turn as Sparrow's father. Richards is a good actor too which for once gives celebrity casting a good name. He even gets to strum a guitar. The romance between Will and Elizabeth is on rocky ground with each hiding secrets from each other until their making up late in the movie's climax. But that's OK. Bloom and Knightley do their jobs well enough (note to co-stars, burn brighter than Depp and you get a medal or a hosepipe trained on you). The nicest conceit of the climax is that true love prevails but wedding vows need to be exchanged urgently because there are a lot of swords flashing. The erroneous cliché of a captain being able to marry on board ship is brought to the fore and despite the silliness the scene works in an almost whimsical and endearing way. I grinned like a village idiot. Bill Nighy's Davy Jones, all tentacles and no heart (it's in the box! ), gets to display a little depth in this outing and even gets to act sans CG for a brief moment.